This isn't quite a "book"; it's the report, in book form, from the House Budget Committee, authored by Rep. Paul Ryan and supported by the rest of the Republican majority of that committee. It is known popularly as "The Ryan Budget", and is the official Republican alternative to the Obama Administration's budget proposal. When Mitt Romney selected Paul Ryan as his running mate, Romney tacitly signed on to supporting the Ryan budget. This budget, and its contrast to Obama's proposed 2013 budget, will be the focus of the debate on economic issues for the 2012 presidential race. We include the "CBO Analysis" of the Ryan budget as well. The CBO is the Congressional Budget Office, a non-partisan analytical service that assesses the cost of all House bills. Rep. Ryan asked the CBO to analyze his budget; they did so in a 29-page letter (the original report is 99 pages). Note that there are several versions of "The Ryan Budget"; both from previous years and in several other forms in 2012. 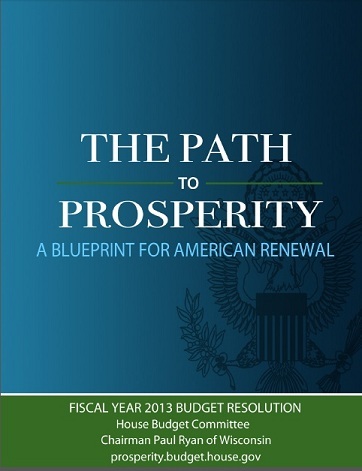 This report represents the "Ryan budget" most at issue in the 2012 presidential election. This report is Ryan's summary of the bill itself, which is known as H. R. 5652, the "Sequester Replacement Reconciliation Act of 2012." That bill, which runs 170 pages, was passed by the U.S. House of Representatives on May 10, 2012. "Sequester Replacement" means the bill replaced the "sequestration" rule enacted by the failure of the 2011 "Super Committee", the Joint Select Committee on Deficit Reduction. "Sequestration" means that the defense budget is cut substantially, alongside cuts to entitlement programs, with the intent of pushing for a bipartisan compromise. The Ryan budget, in briefest summary, restores the defense cuts but retains the entitlement cuts. Paul Ryan: CBO: Spending cuts & revenue increases make surplus by 2040. Jeff Denham: Authorize sale of billions in federal assets. Paul Ryan: Replace PAYGO with CUTGO: new spending must cut elsewhere. Paul Ryan: Fannie & Freddie are failed experiment in corporate welfare. Paul Ryan: Dodd-Frank reforms intensify too-big-to-fail problem. Paul Ryan: 25% top individual rate and top corporate tax rate. Paul Ryan: Student loan increases just translate into increased tuition. Paul Ryan: Cap-and-trade bureaucratically rations conventional energy. Paul Ryan: Automaker bailout abused process to force new fuel standards. Paul Ryan: Develop all American-made energy, including nuclear. Jason Chaffetz: Sell millions of acres of unneeded federal land. Paul Ryan: Sell millions of acres of federal land & federal assets. Paul Ryan: American decline as world power is a choice, not a certainty. Paul Ryan: Foreign-owned national debt puts US at risk during crises. Paul Ryan: CBO: Ryan cuts mandatory health costs from 15% to 6% of GDP. Paul Ryan: CBO: States pay more for Medicaid under Ryan plan. Paul Ryan: CBO: Elderly pay more for Medicare under Ryan plan. Paul Ryan: Seniors are threatened with denied access to care. Paul Ryan: Younger workers choose from subsidized coverage options. Paul Ryan: $554B for national defense spending instead of $55B cut. Paul Ryan: Freeze federal paychecks to boost private sector employment. Harry Reid: Deal with 2036 bankruptcy in two decades, not now. Nancy Pelosi: When do we need to fix Social Security? Never! Paul Ryan: Current policy is raid, ration, raise taxes, & deny problem. Paul Ryan: CBO: Ryan increases revenue to 19% of GDP without saying how. Dave Camp: Boost competitiveness by tax simplification & lower rates. Darrell Issa: Uncovered dozens of food stamp abuse cases. Paul Ryan: Food stamp program is rife with waste, fraud & abuse. Paul Ryan: Time-limit & work requirement for need-based aid. Paul Ryan: Left federal barriers to community & institution empowerment. by the House Committee on the Budget, Chairman Paul Ryan.